A study of the use of pronouns by French speakers with agrammatic aphasia shows that grammatical pronouns are significantly more impaired in speech than lexical ones. The findings support a new theory of grammar which suggests that grammatical elements contain secondary information that speakers with limited cognitive resources can omit from their speech and still make sense. Some individuals with brain damage have difficulty producing grammatically correct sentences – a phenomenon known as agrammatic aphasia. But why are people with brain damage omitting grammatical elements from their speech? 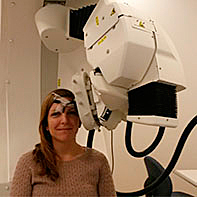 Robot used to examine the localization and timing of brain activity when processing grammar. A new usage-based theory of what grammar is suggests that people with agrammatic aphasia need to prioritise their limited resources and thus concentrate on the primary and core elements of an utterance, the so-called lexical elements such as full verbs, nouns and adjectives. Grammatical elements like inflections and auxiliary verbs, however, only convey secondary information and are therefore dispensable. In a recent study published in Journal of Neurolinguistics as part of Byurakn Ishkhanyan’s PhD thesis Grammar-Lexicon Distinction in a Neurocognitive Context, spontaneous speech collected from six French speakers with agrammatic aphasia and nine non-injured controls were used to test the theory. Not only did the study show that grammatical pronoun production was significantly impaired in agrammatic speech, it also showed that the impairment pattern can be different from individual to individual – which other studies have corroborated. This may be an indication that individuals with agrammatic aphasia employ unique adaptive strategies to cope with the linguistic deficit caused by brain damage. “The two individuals whose speech did not differ significantly from the control group in terms of pronoun production may have found a way to cope with the agrammatism that allows them to produce some grammatical elements. This adaptive strategy is predicted by Professor Jesper Mogensen’s REF-model which offers a novel view of neurocognitive reorganisation and suggests a mechanism for recovery after a brain injury,” Byurakn Ishkhanyan explains. Read the study ‘Grammatical and lexical pronoun dissociation in French speakers with agrammatic aphasia: A usage-based account and REF-based hypothesis’ in Journal of Neurolinguistics. Read more about ProGram – an interdisciplinary research and education center for neurolinguistics at the University of Copenhagen.